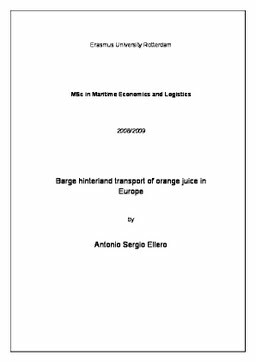 The purpose of this thesis is to verify the feasibility of using tank container barge services for the European hinterland transport of orange juice, to reduce transport costs and to promote the opportunity to divert tanker truck traffic from the congested Port of Rotterdam area to waterborne travel as an alternative transport modal. The world orange juice trade market, industry structure, value and transport chain are discussed in order to help the understanding of this world industry, its products and quality specification which will determine the transport quality requirements and care of the product. The study investigated existing container barge services in established fairways along the river Rhine and the Mittellandkanal to supply customers in Germany, along the river Rhine to supply customers in France and along the Dutch province of Zeeland waterways‟ to supply customers in Belgium through information obtained from barge operators. The existing logistic infrastructure for inland waterway transport taking into consideration the studied corridors were also analyzed in order to determine their appropriateness to handle this new tank container service. The findings of the investigation conducted indicate that the tank container barge service is economically feasible; therefore, for some destinations, barging tank containers would allow avoiding the road tanker truck transport along the congested area of the Port of Rotterdam. Operation and capital costs were analyzed. The operating cost would vary according to the final destination and may result on transport cost reduction around 50% if compared to road transport mode. Capital cost, around € 11,000,000 is the bottleneck of the inland transport mode operation analyzed in the case study and it is represented by the acquisition of reefer tank containers to be deployed for the barge services to orange juice processing companies located in the Fruitport. The actual capital and operating costs would be determinate through a further detailed operations plan for the new service. A detailed operating plan should be developed to implement a start-up tank container service between the Port of Rotterdam‟s Fruitport and the orange juice packer located in Sarre Union, France. The tank container barge service would replace 18,500 tanker trucks per year from the congested area of the Port of Rotterdam with a decrease in 1.0 ton of CO2 emission per ton-mile per year only taking into consideration the orange juice transshipments done by the major companies located in Rotterdam's Fruitport.